When you ship in volume, using less-than-truckload (LTL) for distribution is generally the most cost-effective solution for regional and short haul transportation. However, if your freight is moving a long distance, such as from the West Coast to locations across the country, the cost of moving multiple less-than-truckload (LTL) shipments can quickly add up. One transportation strategy that shippers can utilize to move products long distances that end in regional distribution is known as pool distribution. 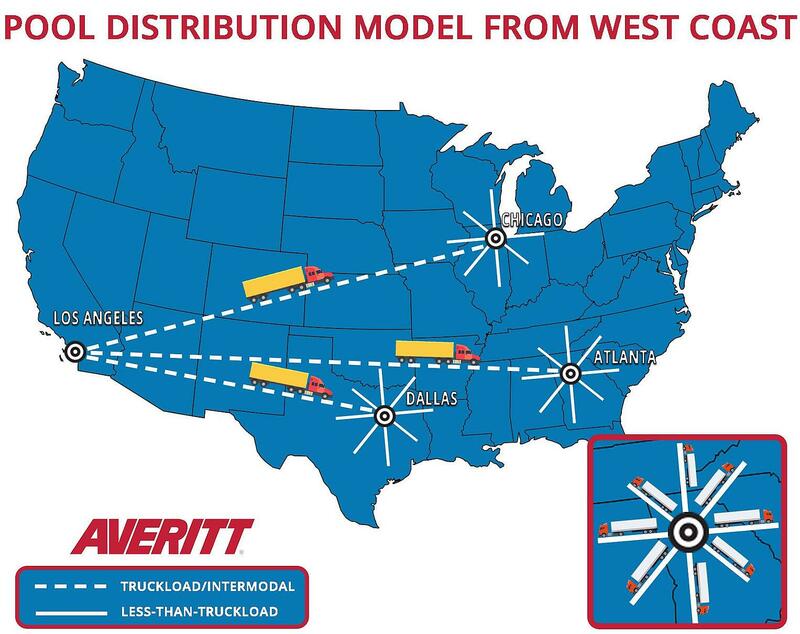 This model is a relatively simple concept that entails the use of truckload or intermodal transportation for the longhaul portion of a supply chain. For the tailend of the supply chain, the freight is distributed via LTL. With a majority of US-bound imports coming through the West Coast that are destined for locations along the eastern portion of the country, this strategy can be particularly effective at reducing transportation costs. Many shippers can benefit from incorporating pool distribution into a supply chain strategy, including businesses that specialize in the retail, automotive, cosmetics, appliances and electronics industries. The following diagram illustrates how a pool distribution model that originates from Los Angeles to markets around Dallas, Chicago, and Atlanta would look like. For this particular example, the outbound freight would be consolidated into full load shipments at a facility in or near Los Angeles. From there, it could be moved via truckload carrier or by rail to the intended markets. Once the full load shipments arrive within their distribution markets, an LTL carrier would deconsolidate the freight for individual short haul deliveries. There are several benefits this strategy can add to your transportation and supply chain strategy. Incorporating a this strategy into your supply chain will allow you to reduce your transit times from point A to point B. This is achieved because the transit route is streamlined to the market or markets your freight is heading. When you ship multiple LTL shipments across a long distance, the freight will make multiple stops along its journey because most LTL tractors and trailers are assigned to specific markets and regions. The time that it will take to hand off freight between LTL lanes and markets quickly adds up over long distances. Utilizing a full volume service, however, puts your freight on a direct path to its intended market. Transporting LTL freight across long distances means that multiple hands will be involved throughout the process. At each stop along the way, the freight will have to be unloaded and transferred to a new trailer. Each movement increases the chance that your freight could incur damage. Additionally, an LTL trailer will contain freight from numerous shippers. By utilizing a full trailer or container for your products, there is less of a chance that your freight will be damaged by the movement of other freight that can vary in size, weight, and shape. #ShipperProTip: Together, you and your carrier play an important role in ensuring that freight arrives to its destination on time, on target, and intact. Check out our video that illustrates what can happen inside a trailer when proper packaging and freight stacking practices are not used. The overall costs of moving multiple LTL shipments across long destinations will quickly add up. When multiple shipments are destined for the same market or region, utilizing truckload or intermodal services, including trailer on flatcar and container on flatcar, for the long haul can reduce your overall transportation costs. Think of this process as purchasing non-perishable foods in bulk. It may seem expensive at first glance, but when you begin adding up the number of individual purchases over time, the costs savings can be substantial. The level of customization you can obtain with a pool dis tribution model is much higher than using a standard LTL service for long haul transportation. You will find that you can target specific markets with a streamlined approach to your volume LTL distribution. With these benefits in mind, it's important to know that succeeding with this strategy will rely on the ability of your logistics and transportation service providers to identify the most beneficial routes and carriers to utilize. For that reason, work closely with your service providers and ensure that the lines of communication are always open. Together, you can find innovative ways to improve and streamline your supply chain.